It is thanks to the web site Ajedrez del Estilo that I became aware of this interview. The year 1871 proved to be a "annus horribilis" for the Chicago chess and the city of Chicago, the year started out well enough, with the visit of Captain George Henry Mackenzie in January and February ( see previous post ). An organizing committee had been formed and had held meetings since the previous year in hopes of holding a chess congress for sometime in 1871, with a good chance of it being held in Chicago.The rapid growth of the city in since its founding appeared all but unstoppable, the city was booming. All of that was about to change, for around 9 o'clock on the evening of Sunday October 8th, near or in the barn of Mrs. O'Leary, the "Great Chicago Fire" had begun, the story goes that a cow knocked over a lantern in the O'Leary barn, but how it actually started is open to conjecture. 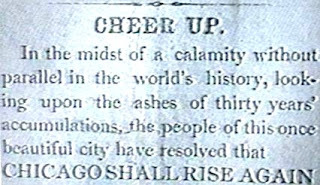 It had been a dry summer and once the wind took hold of the fire, there seemed no stopping it, the fire jumped the Chicago river at several junctures, buildings thought to be" fireproof" went up in flames including that of the Chicago Tribune. "It was like a snowstorm only the flakes were red instead of white." 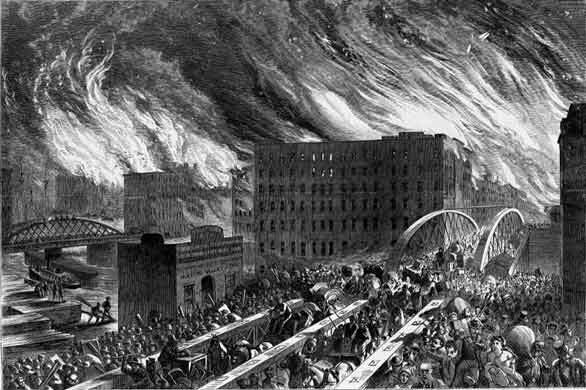 The very streets caught fire, as the much of the paved roads, the sidewalks and the city bridges were constructed of wood, like so many of the city's buildings, the haphazard nature of the city's construction would greatly contribute to the destruction. The fire raged northward to the city center destroying hotels, department stores and City Hall. Firefighters exhausted from fighting a large fire on Saturday were outmatched, the collapse of the roof of the Pumping Station at Chicago Avenue sealed the city's fate. On Monday evening, a light rain began to fall, by Tuesday the fire had burned itself out. For days afterwords the city's ruins were too hot to survey, all told over 300 souls lost their lives, and over 100,000 inhabitants were left homeless, a third of the city's population. Almost at once people began to rebuild, many seeing an opportunity in the aftermath of the fire for a better life. Just months (December 4- 15) after the "Great Fire" second American Chess Congress was held in Cleveland, fortunately the decision to hold the congress in that city rather than Chicago having been made prior to the fire. Frederick Bock, who had played a match with Captain Mackenzie just a few months previous, during the former's visit to the city, had translated "The German Handbuch" (Bilguer's Handbuch des Schachspiels) into English, which was at the printers waiting to go to press, when the fire broke out, Bock's manuscript of the "Handbuch" was consumed by the conflagration. 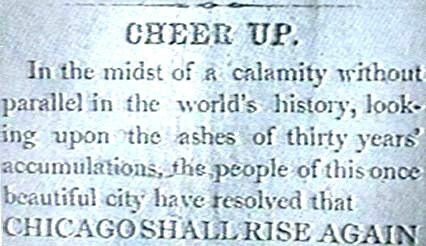 On March 17, 1872, a notice appeared in the Tribune, that despite the fire and the business of rebuilding the city, chess play continued take place. How "grand" the tournament turned out, one can only hazard a guess, as I have been unable to locate any further information. But at least a start was made, but progress slow and painful, it was not til late 1873 that a new club, formed to replace the old Chicago Chess Club. Chicago did indeed host the third American Chess Congress, which was held from July 7th to the 16th, which was won by Captain Mackenzie. But any benefits of holding the congress in Chicago were short-lived, chess continued to have a hardscrabble existence in the windy city. As late as 1887, the lamentable state of chess, was the subject of comment in the local press. It was not until the founding of the Chicago Chess and Checker Club in 1891, that Chicago chess-players had a club worthy of the name. Note: for further information on the Great Chicago Fire, here is a link to the Chicago History Museum.